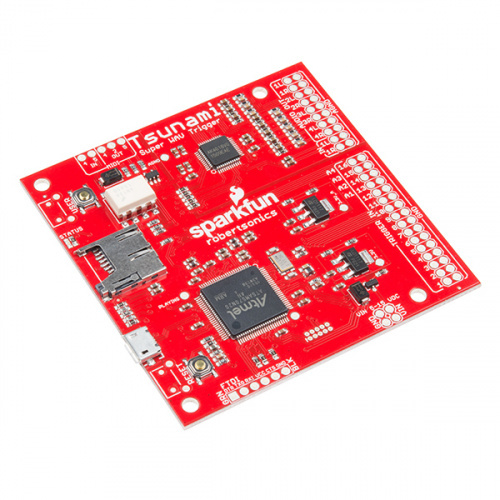 Tsunami is the next-generation SparkFun polyphonic WAV file player. Tsunami is a bigger, better brother to the WAV Trigger. It starts with the same polyphonic WAV file playback engine, then adds a bunch of new features. First, Tsunami features eight analog outputs, which can be configured as either eight mono outputs or four stereo outputs. In stereo mode, it can simultaneously play 18 stereo WAV files. In mono mode, it can play back 32 mono WAV files. Mono mode also offers a track synchronization option, which allows for playback of multichannel content, including quadrophonic, 5.1 and 7.1 surround formats. Tsunami also features a stereo audio input that can be mixed into any combination of the outputs. Each output provides independent, real-time volume control and pitch bend. WAV files can be independently mapped to outputs. Up to 4,096 WAV files can be indexed and played off a microSD card. Tracks can be triggered via three different interfaces. There are 16 onboard inputs that can be tied to switches or logic-level devices. The FTDI-compatible footprint allows serial control from a computer or microcontroller. There are onboard MIDI input and output circuits --- just add DIN-5 sockets. Tsunami offers low latency. Tracks typically start within 8 mSec of a trigger event. Detailed track control --- tracks can start, pause, resume and stop, and loop seamlessly. Firmware can be easily loaded from the SD card, which facilitates switching between stereo and mono playback modes, as well as upgrading as new features are released. Tsunami was developed in collaboration with Robertsonics. A portion of each sale goes back to them for product support and continued development. This guide will show you how to start using Tsunami. We'll start by putting .WAV and configuration files on a microSD card, then pop it in Tsunami, then trigger sounds across multiple outputs. If you need additional inspiration for your Tsunami project, please check out our related tutorials below.